SABR sells and distributes Loftware Connector for Barcode Label printing and RFID encoding integration with various Applications. Loftware Connector® is a software application that acts as a high speed 'connectivity bridge' between your applications and the Loftware Print Server®. Intelligent data filtering and decision making tools can be harnessed to abstract the complexities of high volume label printing from your application. The connector is typically used in larger, high volume applications, which makes it an excellent choice for ERP and WMS solutions. 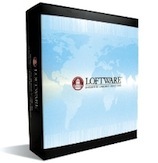 Please Note: Loftware Connector (all versions) requires Loftware Print Server Premier Edition.